The Roland Aira System 1 is an incorporation of Roland's vast synthesizer and software knowledge, all rolled into one portable and extremely.. 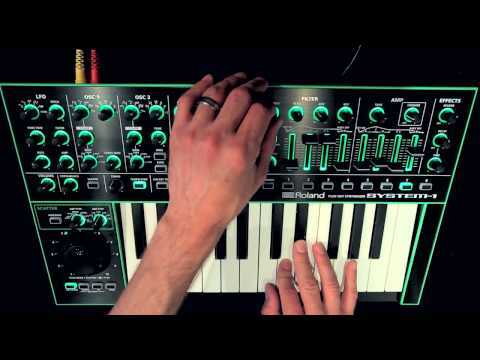 The Roland Aira System 1 is an incorporation of Roland's vast synthesizer and software knowledge, all rolled into one portable and extremely versatile synthesizer for live performance and serious studio musicians. Aside from an impressive array of built-in patches and sounds for you to edit and play at will, the SYSTEM-1 can control and even host software recreations of classic Roland synthesizers from the ages. Think about that for a second - Jupiter, Juno, GAIA...The SYSTEM-1 can control plug-in versions of these legendary Roland synths, and those same plugins can be hosted in the SYSTEM-1 itself - with no computer required. You can even switch between the SYSTEM 1’s internal sounds and those of the hosted plug-in very quickly, making it perfect for complex stage performances or auditioning sounds in a studio environment. Four built-in oscillators provide a powerful backdrop to create sounds from scratch, with an array of hands-on controls and sliders to tweak every last detail of your sound. 25 comfortable synth keys allow for expressive melody playback, performance ready controls, quality construction, and a sleek array of lights that ensures the System 1 stands out from the rest of your keyboards on stage! The entire AIRA family has been updated with exciting and useful new features requested by users from around the globe. Easy to install and free for all users, this update includes enhancements to the whole line, such as backup and restore facilities, and better overall MIDI management. It also provides a wealth of product-specific enhancements, such as external MIDI pitch control for VT-3, tuning control for TB-3, and instrument gain control for TR-8. Click here for more info. The SYSTEM-1 can control—and even host—software recreations of classic Roland synthesizers. That’s right—the SYSTEM-1 gives you access to plug-in versions of legendary Roland synths, and they can be hosted in the SYSTEM-1 itself, with no computer required. You can even switch between the SYSTEM-1’s internal sounds and those of the hosted plug-in. We think you’ll be excited too once you experience the supreme authenticity of the SH-101 soft synth, with the SYSTEM-1 providing an intuitive and fully automatic one-to-one control interface that just works. Let’s be honest: who could make a better plug-in version of a classic Roland synth than Roland? And the SH-101 is just the beginning—more PLUG-OUT synths are on the way.